I approach reviewing a ballet as an audience member would: if the ballet is new to me but has already been performed, I don’t study prior reviews, or play CDs or YouTube excerpts to become familiar with the choreography I’m about to see or landmark performances of it. I view it for the first time as would anyone else in the audience. But that doesn’t leave other prior relevant observations off the critical table. Having just seen and reviewed Sylvia, a ballet choreographed by Sir Frederick Ashton, which I concluded was overly fussy and, barring exceptional performances, no longer the significant work it may once have been, and having felt the same way about his Cinderella, I approached American Ballet Theatre’s revival of Ashton’s version of La Fille Mal Gardée, which began a week’s run at the Met on Tuesday, with trepidation. I recall seeing an ABT production of the ballet previously, but not Ashton’s version, which the company did not perform until 2002. Sure enough, the ballet began by living down to expectations – it looked as if it was going to be a bad comic version of Act I of Giselle. There’s a village, and a farm girl (Lise) instead of a village maiden. 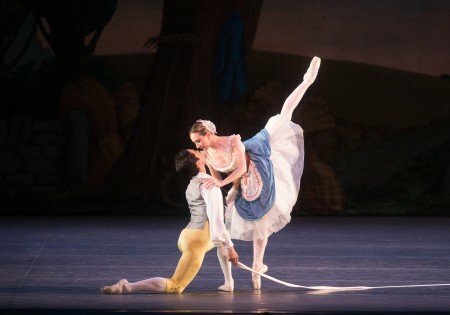 There’s a young man (Colas) who may be the liveliest male dancer on stage but not the sharpest knife in the drawer (ok, so there’s a little of Coppelia), and there’s a mother…of sorts (Widow Simone). There are Giselle’s, er, Swanilda’s, er Lise’s “friends,” and townsfolk crisscrossing the stage, foreshadowing…well, there are no Willis. There’s an introductory ‘isn’t it sweet’ pas de deux. And there’s a brainless numbskull instead of a clueless ruffian, the way Hilarion is often played (actually he’s more of an intellectually challenged fop – a little of Don Quixote). Since it’s a comedy, of course there’s no drama, but instead there’s the same fussy choreography, a man portraying a woman, a dancing rooster and chickens that might have been more appropriate for a suburban ballet school recital, and a subject that’s too sweet for diabetics. And then there’s this ribbon that hocus pocus morphs into a cat’s cradle. Cute, but as artificial as the ballet’s story. Up to this point, the ballet is so light that a gust of wind might blow it away. Things pick up during the Act I inter-scene procession in front of the drop curtain – the ribbon-coach carrying Lise’s friends is nifty. But when Scene 2 opens to happy farmworkers laboring and dancing in the fields, obviously preparing to crown Lise as queen of the wine, er, harvest festivities, I started to lose all hope. And then, suddenly, it all began to work (and in hindsight had been working from the outset). The staging came to life; the artificial sweetness became real, sort of, but no longer mattered; and choreographic genius and superb performances took over. And then I began to smile a lot. And admire it a lot. And love it….well, sufficiently. Diabetics should still be wary, but Ashton’s La Fille Mal Gardée is like that birthday present you received as a child and didn’t appreciate how surprisingly wonderful it was until you took off the wrapping, opened the box, and played with it. For icing on the cake, the opening night cast delivered superb performances across the board, and Lise is Isabella Boylston’s finest role to date. Since then there have been many different productions of the story, some using the 1828 score by Ferdinand Herald, and some using the 1864 score by Peter Ludwig Hertel. Previous versions presented by ABT were choreographed to the Hertel score. The music that Ashton uses is from the Herald score, freely adapted by John Lanchbery. Very freely: the score for this version is pasted together from pieces of the Herald score used as a base (some of which Herald took from other sources), together with excerpts from the Hertel score (for the clog dance), operas, snippets of music from the Dauberval version, and original Lanchbery composition. But as with most everything that Lanchbery touched, the music flows seamlessly. As Lanchbery assembled, arranged, and recreated the score, Ashton did the same with the choreography, drawing inspiration from the piece’s various choreographic predecessors, including the Gorsky version (1903), which itself was based on choreography by Marius Petipa and Lev Ivanov for their 1885 production by the Imperial Ballet in St. Petersburg (which itself reportedly was based on the Paul Taglioni version of 1864). Indeed, the turnaround for me in Act I, Scene 2 came in large part as a result of a synthesis of remarkable stagecraft, and the choreography looking like the best of Ashton’s complexity, clarity, and delicacy mated with the visual excitement and athleticism typical of Petipa/Ivanov. Thanks to the “ribbon” motif, which Ashton expanded from the Pas de Ruban in prior versions (and which he modified and incorporated into his), this ballet has a rare sense of visual unity beyond what might be provided by choreographic style. That having been said, it’s also full of surprises. Since there may be readers who, like me, have not seen this version, I won’t spoil it. Too much. However, there are two scenes in the ballet that must be highlighted because they seem to come from nowhere, but explode (quietly) and dominate the memory. The turnaround I mentioned was the unexpected Grand Pas de Deux in Act I, Scene 2. As was customary at the time, leading ballerinas often supplemented basic choreography with additional music that they particularly liked, which they then had choreographed to emphasize their talents. 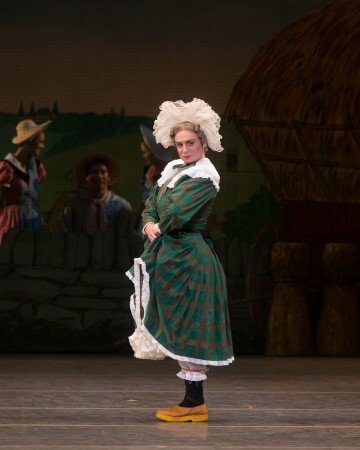 In 1837, Fanny Elssler, one of the most famous ballerinas of the early 19th century, debuted in a version of La Fille Mal Gardée choreographed to the Herald score. She added a pas de deux to excerpts from Donizetti’s popular opera, L’Elisir d’Amore. This pas de deux became known as the Fanny Elssler Pas de Deux. Ashton resuscitated it and rechoreographed it. As it appears in Ashton’s version, the Fanny Elssler Pas de Deux is remarkable on multiple levels. The “standard” pas de deux for Lise and Colas is extraordinarily powerful, with stereotypical Petipa/Ivanov displays of virtuosity. But it also has a remarkable segment in which Ashton utilizes the ribbon theme (including roughly repeating the “cat’s cradle” image from Scene 1), and has Lise’s friends create a carousel/maypole out of the ribbons – presumably the ones that transported them to the field during the inter-scene procession – around and through which the two lovers dance (yes, somewhat like the maypole in Giselle, but this is considerably more spectacular – and there’s another, more conventional, maypole later). Spoiler alert: at one point, Lise becomes the pole. It’s comparable in impact to the magic that George Balanchine created with his Nutcracker when the Sugar Plum Fairy seems to float across the stage while standing in place en pointe, but here it’s not magic, and it’s considerably more spectacular. Visually quieter, but just as impressive, is a segment in Act II that reportedly appears in the Petipa version known as the “When I’m Married” scene. With a minimum of choreography and a maximum of mime, stagecraft, and superb acting, Lise dreams of being married to Colas and having a family. It’s a miraculous piece of work, and Boylston delivers it brilliantly. Initially, the segment looked similar to the snippet of Ashton’s Cinderella in which Cinderella dreams of dancing at the ball with the Prince (in the form of her broom) – Boylston had that same dreamy look that is engraved on my mind from Alina Cojocaru’s Cinderella portrayal more than a decade ago. But this segment is far more complex than that, and far more emotionally gripping. If you have any semblance of a pulse, this scene will move you to smile and laugh and cry simultaneously. It’s an extraordinary conception, extraordinarily performed. The “Fanny Elssler Pas de Deux” and the “When I’m Married” daydream, are alone worth the price of admission. But there’s considerably more to this ballet. Once I recovered from my initial prejudice, and replayed Scene 1 in my mind, La Fille Mal Gardée is clearly top of the line from beginning to end. I can even handle the dancing chickens. The entire cast of Tuesday’s opening night performed flawlessly. In addition to Boylston, Roman Zhurbin was sensational as the Widow Simone. I find such characters more tiresome than funny – the concept wears thin quickly, but Zhurbin breathed life into it. Every gesture, every nuance, was finely tuned and crisply delivered. As Alain, Lise’s dimwitted would-be suitor, Craig Salstein delivered his usual over-the-top without being too over-the-top performance, including a brilliantly executed comic “mad scene” (no, not like Giselle). Jeffrey Cirio’s Colas, which at first I found concurrently too bland and too cute, evolved into a sterling performance individually, and a super display of partnering and strength. A substantial part of the credit for the success of this production also must go to Malin Thoors, who staged it. Since I had not seen the Ashton version previously, I don’t know whether she made any modifications to the original staging. Regardless, it clearly was a monumental effort that has paid off. Boylston, who was ”on” from the moment she hit the stage, merits special acclaim. She’s the perfect farmer’s widow’s daughter. Not one misstep; not one false emotion. The only time I saw a bit of a hesitation was toward the end of Act II, at the point where Colas bicycle-lifts her high overhead. She seemed just a tad apprehensive – understandably. But when she hit terra firma, I could see the apprehension turn to a glow: the hard/scary part was over, and they’d done it. They certainly did.